When Eddie Heath went off to college at Texas A&M, he was determined to get a motorcycle. In a moment of serendipity shortly after school began, Heath was visiting a friend in Houston who was “practically giving away” a Kawasaki 250. But Heath faced a dilemma: how to get it back to college. He was driving a ’64 Chevy Impala roughly the size of a modular home, so an idea came to him that seemed to make sense, as ideas can only make sense when you’re a college freshman. “So I threw it in back seat and drove back to the jock dorm with a motorcycle in the back,” Heath said with a laugh. That was just the beginning of what would become Heath’s lifelong motorcycling adventure. He’d never ridden a motorcycle, but that didn’t stop him from sitting on the 25 outside the dorm, trying to look cool. Fortunately for pets and their owners throughout northern Buncombe County, Heath’s riding skills improved dramatically over the years. 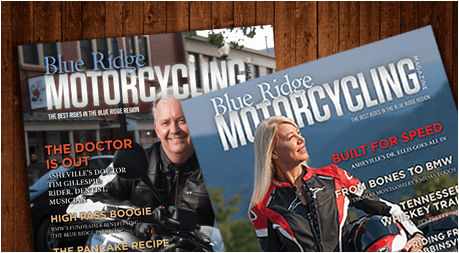 A veterinarian who in 1993 established his thriving Weaverville practice, All Pets Veterinary Hospital and Rehabilitation Center, Heath now rides a 2002 Harley Softail Standard – and he stays on the Parkway and out of the hedges. A defensive end on the A&M football team, Heath acknowledges that at nearly 6 feet 5 inches tall and 230 pounds, he was an odd sight on that 250, a little akin to a circus bear on a pit bike. And while he mastered that small, quick bike, the initial foray into vegetation always stuck with him. 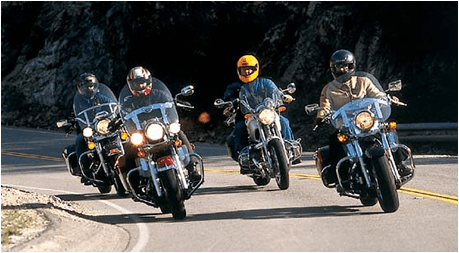 After about six months, Heath upgraded to a Harley Sportster, which he at one point rode into the back of a car at low speed when a car driver suddenly decided he had to make a left. The wreck bent the forks, so Heath put the bike in his kitchen and totally rebuilt it, replacing every worn or rusty part and adding a lot of chrome. With bored-out cylinders and a performance carburetor, it was a fun ride. But it was not smooth. He remembers riding it to class, no helmet, as Texas law didn’t require one, with his necktie and veterinary student’s white smock flapping in the breeze. Still imposing and fit, Heath is not one to dwell on his football career. From the time he was little, growing up with basset hounds, he knew he wanted to be a veterinarian. But he did get a tryout with the Atlanta Falcons in 1979, playing in several pre-season games and making it to the next-to-last cut. He worked for a vet in a town about 35 miles from College Station, where A&M is located, riding his Harley to work every day, even when the weather got chilly. After graduating from A&M’s veterinary school, Heath moved to Dallas and settled down, getting married and having a son, followed by a daughter. 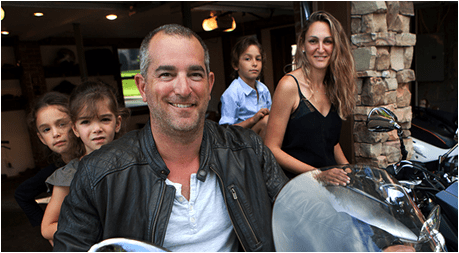 Working 60-hour weeks and raising two children wasn’t terribly compatible with riding his Harley, so when Heath and his wife moved to the North Carolina mountains in 1991, he sold the bike. Heath had started his All Pets veterinary office with just himself, a veterinary tech and a receptionist, so riding remained out of reach for years. But Heath and his wife, a physician, divorced in 2002, and Heath got his current Harley a few years later. While he’s still working 60-plus hours a week, he is back in the saddle whenever he gets a chance. All pets has four full-time vets and one part-timer, and a total of 25 staffers, so Heath doesn’t have to carry quite as heavy a load as the early days. Clearly, pets are Heath’s calling in life, including his two current loves, a 9-year-old male retriever/bichon frise mix named Tripp, and a recently adopted female Chihuahua/dachshund mix, Sophie. But it is a close race as to want makes Heath light up more – talking motorcycle, or talking pets. Claudia Peterson, the office manager at All Pets, has been there for 20 years, but she’s been taking her pets to Heath for 24. He’s also put Peterson and a couple other employees in motorcycle boots over the years. 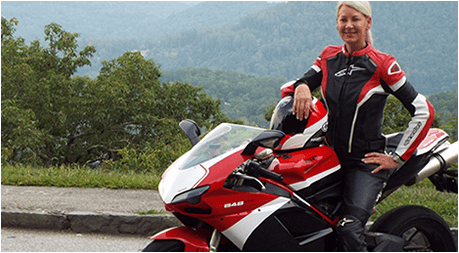 “We actually took the motorcycle safety class together,” Peterson said, adding that she ultimately bought a Honda Shadow 750. Peterson says Heath is a “wonderful boss,” but she can tell when he’s been out for a really good, long ride. Like a lot of former football players, Heath endures some orthopedic woes, although he says his hip replacement nearly 20 years ago came about more from jumping off the roof of a house in younger years that knocking down grown men on the gridiron. He does have some lower back issues, so Heath limits most of his rides to the mountain region. But he squeezes an enormous amount of enjoyment out of every ride. “I understand why dogs stick their heads out of windows now,” Heath said with a laugh. Heath and Robyn Hite, who owns a four-wheeler and a dirt bike, started dating early this year and live together now in north Asheville. She rides on the back of Heath’s Harley, but she used to ride street bikes, including a BMW R1100, and the yen is getting strong to get back on the handlebars. Her teenage sons are getting older, though, and she’s sorely tempted. Heath said he can see her getting a bike herself, which for him would make for an ideal romantic relationship. Riding on the back is exhilarating, Hite said, especially because Heath is a really safe rider, although he will on occasion punch it on a straightaway. “He gets this little giggle when he’s done, like a little kid,” Hite said. While he just entered his seventh decade, Heath has no plans of slowing down, either in his practice or on the throttle of his beloved Harley. He loves working with animals, even though he’s had to slow down on the more physically intense orthopedic surgeries he loves. And he never tires of the feeling of the sun on his face and wind rushing by. He’s got a Saab convertible, and Heath bought an all-electric Tesla car that can hit 60 mph in less than four seconds. But nothing matching the exhilaration a motorcycle running through the gears.